Prasanna Wickramasuriya, the former head of the Airport and Aviation Services Limited is to be probed over gold, jewelery, gems and other valuable goods worth millions of rupees which had gone missing from a safe at the Bandaranaike International Airport in Katunayake during his tenure as its Chairman. Wickramasuriya, first cousin of former President Mahinda Rajapaksa will come under the microscope of either the CID or the FCID on the above case shortly, sources said. Some employees of the Airport have complained to the Presidential Commission Investigating Corruption and Fraud that a large amount of gems, gold jewellery and other valuables had dissapeared mysteriously after Wickramasuriya vacated office following his cousin Rajapaksa’s defeat at the last Presidential elections. According to sources Wickremasuriya who had stayed abroad for a long period is currently in Sri Lanka and could be called for questioning within the next few days. The items which were locked up in a safe are said to be ones which have been recovered by airport officers over a long period. These are said to be items which had been abandoned by smugglers at the airport premises fearing detection by customs or security officers. These items handed over to the airport authorities through Security Units had been kept in a safe at the airport manager’s safe as unclaimed items waiting until confiscating orders came from relevant state authorities. The loss has been detected after officials had checked the items registrary. Some employees have complained that the items had gone missing during Wickramasuriya’s time as the Chairman. 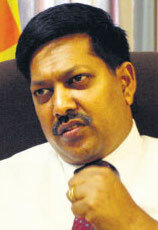 Wickramasuriya was appointed as the Chairman of the Airport and Aviation Services during former President’s tenure.